2. More AF point: Sony A3000 have better AF system compared to Nikon S3200, Sony features 25 AF points and Nikon D3200 features 11 AF points only. 3. Better Video Mode: Sony A3000 Supports Full HD Video capture mode @ 60fps frame rate, Nikon Full HD is limited to 30 fps only. Why Nikon D3200 is Better ? 1. 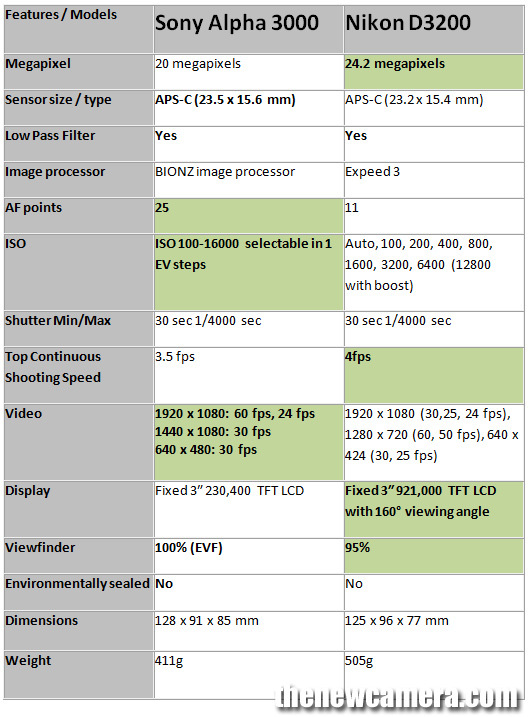 More Megapixel (20 vs 24) – More megapixel compared to Sony A3000, The D3200 sensor size is bit smaller than Sony but it offers more megapixels. 2. Bit Fast Top Continuous Shooting Speed (3.5 vs 4 fps) – Nikon D3200 features 4fps of shooting speed and Sony A3000 limited to 3.5fps only. 3. High Resolution Display – Nikon D3200 features High-Resolution display compared to Nikon D3200. 4. Optical Viewfinder – Nikon D3200 offers optical viewfinder, Sony have EVF. Other features – Nikon D3200 features external mic jack A3000 is missing, Sony A3000 features Auto HDR mode and Dynamic Range Optimizer (DRO). The is NO Build-In SteadyShot in the ILCE3000!!! Its a wrong information. Thanks for the info, We have Corrected the mistake.